Romitaman Original Comic Book Art :: Private Collection :: Daredevil SOLD SOLD SOLD! 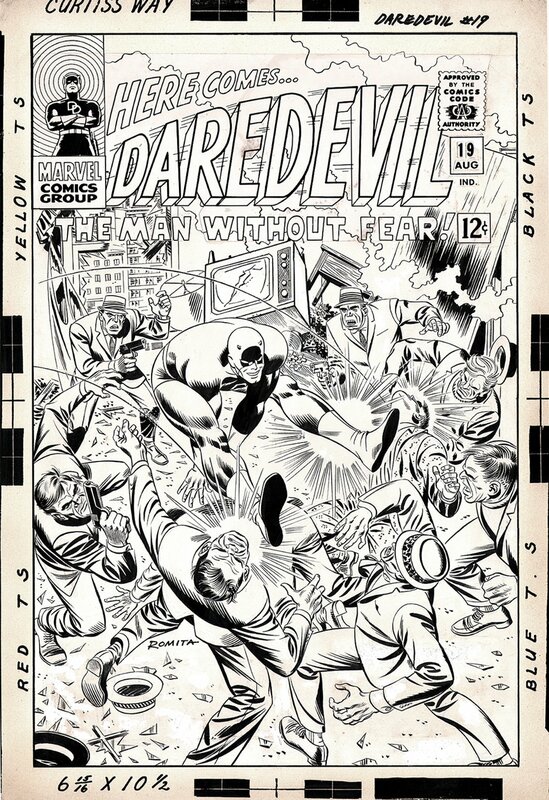 by artist John Romita Sr.
Click Here To See Daredevil #19 Comic Book! There are only a handful or large art John Romita super hero covers in existence, and only a very few surviving DAREDEVIL COVERS from his 9 issue run, which were all drawn a year before John Romita took over the drawing chores for Amazing Spider-Man #39! This INCREDIBLY detailed 1966 LARGE ART Daredevil cover which was penciled and inked by the great JOHN ROMITA SR. from the story titled: "Alone--Against the Underworld!" 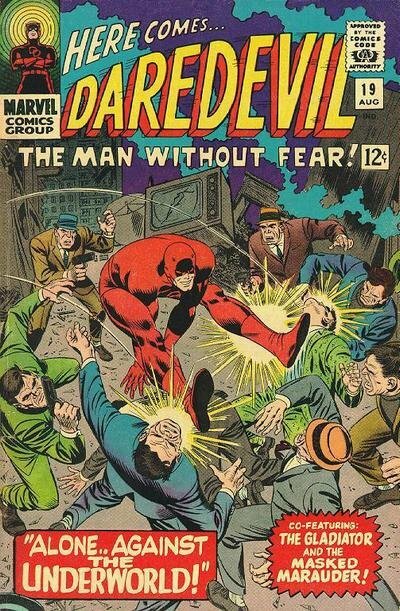 This splendid cover features Daredevil battling "The Mob" as he leaps and beats up 8 gun-toting mob members at the same time! This LARGE cover has an actual drawn art image measuring 13.25 by 20.25 inches on a much larger board! The art was initially trimmed just outside of the drawn art area but the art has been placed onto a new board showing the registry marks, and it looks great! Compare this nice cover art to the published comic book in the red link above, COOL! ALL HIGH end pieces of art, including this one, are able to be purchased with VERY fair time payment plan options, and trades are always considered towards this and any other pieces of art on my site here! Just send me an email and we can try to work something out.